Okay, so although a few have entered my giveaway, I never told you when I would be announcing the winner. Sorry! That was an oversight on my end. Contest will run through this Friday, October 14th at midnight. Just like all my other contests, you can win and gift the shoot to someone if you do not live locally. It truly is as easy as following my facebook page or leaving a comment if you are already a follower. So get on over and enter because I want to see your kid in their costume! Also, the date of the shoot will be changing to Saturday, October, 22nd. The time slots and location are still the same. What is not to love about a kid in a Halloween costume! 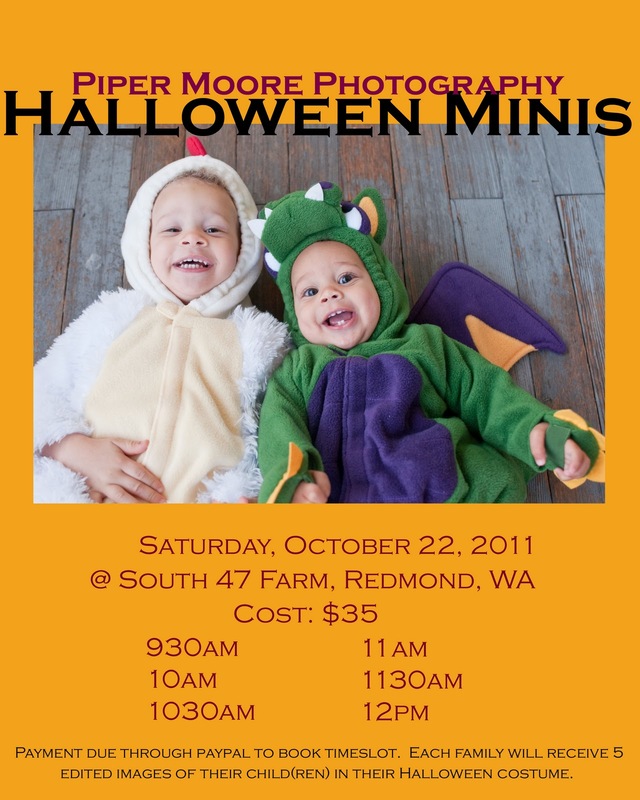 So I can't think of a better first try at a mini shoot event than with a Halloween costume session. The first session will be Friday, October 21, 2011 at South 47 Farm in Redmond, WA. If there seems to be enough interest in this event I will add a second date, with a second location, so please let me know if you are interested but this particular date does not work for you. These shoots require the $35 payment to be made through paypal in order to reserve your preferred time slot. This is non-refundable. * Each family will receive 5 edited high resolution images of their child(ren) on a disk prior to Halloween. Now for the good part: Want to win a shoot???!!! I will be giving away one of these shoots (a 1230 time slot) to one family. It's very easy to enter. Head on over to my facebook page and like it. Already a follower? Just write a post on my wall to tell me you want to be entered and you are good to go. You can get an extra entry by making a donation to Children's Hospital and let me know you did so. Why Children's Hospital? Because with a day like Halloween, where we know it's just for fun but not really necessary, we can only hope that each child that is receiving help from Children's Hospital this year will be running around in their favorite costume next year! Spread the word and tell your friends! If the winner of the shoot has already reserved a spot your money will be refunded to you. *I do know I am working with kids smack in the middle of flu season, so while the payment is non-refundable I do have a heart and would prefer you not share the flu with everyone else so please contact me with special cancellation circumstances such as the flu :). Can you enter us into the contest? My daughter currently wants to be a "snake bat" so this could be interesting.